Barbara Harris, the first female Anglican bishop 30 years ago, says sexism and racism remain and more women and people of colour should become leaders Barbara Harris made history 30 years ago by becoming the worldwide Anglican Communion’s first female bishop when she was consecrated in the United States.The emotional ceremony – in which she declined police advice to wear a bullet-proof vest – took place in Hynes convention centre in Boston, Massachusetts, in front of five choirs, 62 bishops and a congregation of 8,500.Bishop Harris, now 88, told the Religion Media Centre: “The excitement of that day, the awe of that day, still lingers with me.”Her appointment as a suffragan, or assistant, bishop in the Episcopal Diocese of Massachusetts was hugely controversial at the time.In the run-up to her consecration on 11 February, 1989, Barbara Clementine Harris, a former public relations executive for the Sun Oil Company, had faced a barrage of criticism from traditionalists – some of it unpleasant.Recalling the atmosphere, she said some of the mail she received had been “very vicious, nasty and insulting”. Bishop Harris, a life-long campaigner for equality, resisted the advice of the Boston police department to wear a bullet-proof vest during the service. “I reasoned that if someone was going to shoot me, what better place to die than at an altar,” she told the Religion Media Centre. As a black activist, she took part in Martin Luther King’s march from Selma to Montgomery, Alabama, in 1965. Yet 54 years after that protest, racism still persisted, as did sexism, she said. While she believed the Church had made progress, she called on Anglican bishops and the Archbishop of Canterbury Justin Welby to do more to support and encourage women and people of colour to put themselves forward for ordination. She also urged church leaders to challenge discrimination. “Quite a few women of colour have been elected to the episcopate in the US and in some other areas of the Anglican Communion recently,” she said. 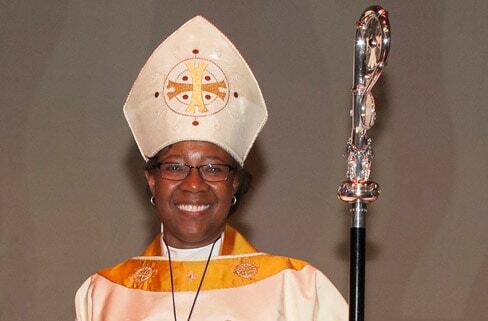 “Two years ago, I participated in the consecration in Indianapolis of Jennifer Baskerville-Burrows, the first black woman diocesan bishop in the Episcopal Church. Two others have been recently elected as diocesans. “I was also privileged to participate in the consecration in Canterbury Cathedral of Dame Sarah Mullally as Bishop of London and Rachel Treweek as Bishop of Gloucester a few years ago. “It is certainly heart-warming to see women being consecrated in the Church of England and other places and I certainly hope there will be many more. I think the Church generally is trying to move in the right direction, but the pace is slower than some of us would like to see, given the times. Bishop Harris said church leaders should be more active in encouraging women to overcome their hesitancy in taking up leadership roles, as well as “identifying sexism and challenging it”. She said she was “immeasurably grateful” to the people of the diocese of Massachusetts for putting their faith in her 30 years ago. She would be celebrating the anniversary at a dinner with the current Bishop of Massachusetts and a few friends. The Religion Media Centre is an independent, impartial body helping journalists and other media professional to cover religion.